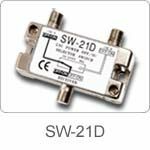 The SW - 21D is a RF signal selection switch which use in satellite receiving system. It can accept two signal from LNB of satellite dish then selecting the other one to pass via power OFF / ON of satellite receiver. If the signal of set - 1 is passed to satellite receiver and the signal of set - 2 is OFF, when power OFF then power ON the signal of set - 2 is passed and the signal of set - 1 is OFF. • Signal And DC Power, ON / OFF Together. • May Combine With 22KHz or 14 / 18V Sat-SW as Multiswitch to Use. • Mini Size, Easy Install.